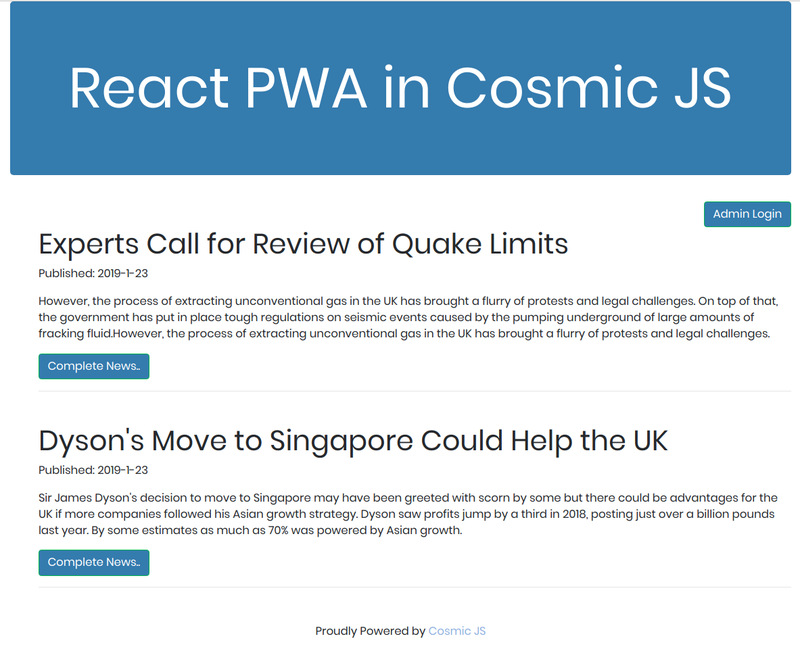 In this tutorial I will show you how to build a progressive web app using React.js and Cosmic JS. Our PWA will respond with status 200 when you are offline. The app will attain the last state of data and display it to you when you are offline. We will start with the basics and complete the app in full details. After completion we will deploy it to the Cosmic JS App Server, so let's get started. We will be implementing this app using React.js with the power of Cosmic JS. Let's start. Node.js must be installed on your system to to run npm commands, with the help of which we will install react app. For more information, you can refer to React Docs. 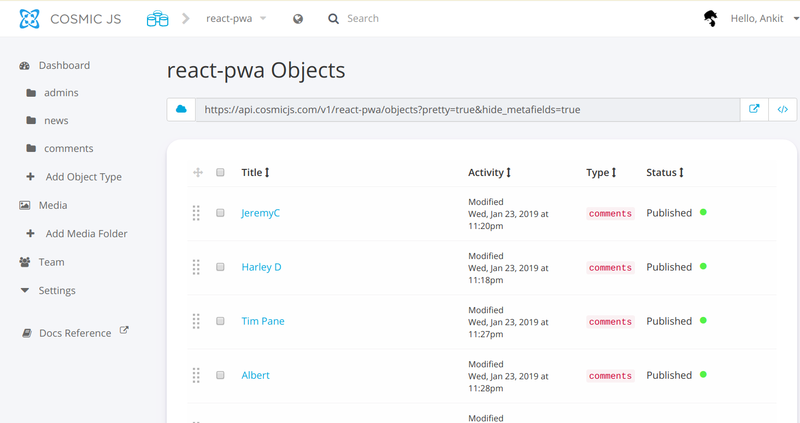 Till now, we have just implemented the front-end part of the PWA, now it is time to configure the server i.e. Cosmic JS server and database. It gives two in one facility. First of all, signup on Cosmic JS for free and create your first Bucket. Now create an Object-Type, which in our case is Admin. Similarly create two more object types named 1) News and 2) Comments. These three object types have different purposes: Admin will save the credentials of admin, News will save the news published by admin and Comments will save the comments posted by users. To manage your project properly, you should create different folders for components, services, config files, css and images. It will help any third person to understand your code properly. All of these folders should reside in src folder. So create them first and jump to next step. 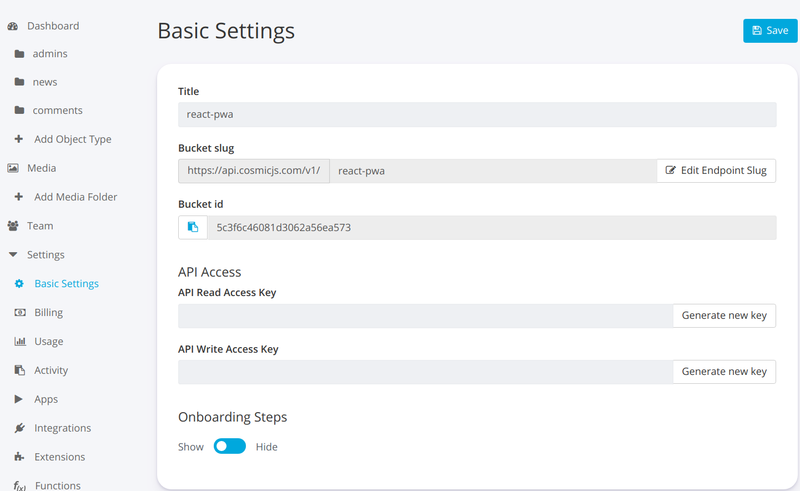 For this project you can directly import a bucket to your dashboard, in that bucket we have already created object-types. 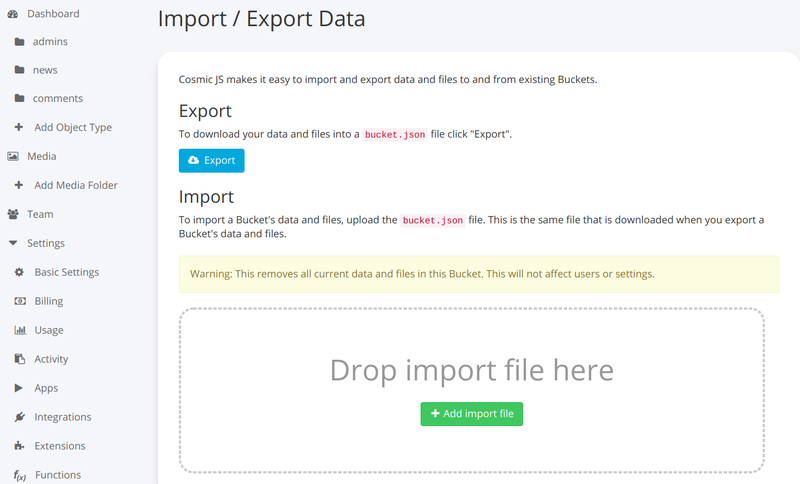 You have to download bucket.json from our git repo and then just follow the steps: Choose default bucket > Go to Settings > go to Import / Export and click the button "Add import file". It will import the bucket.json file. 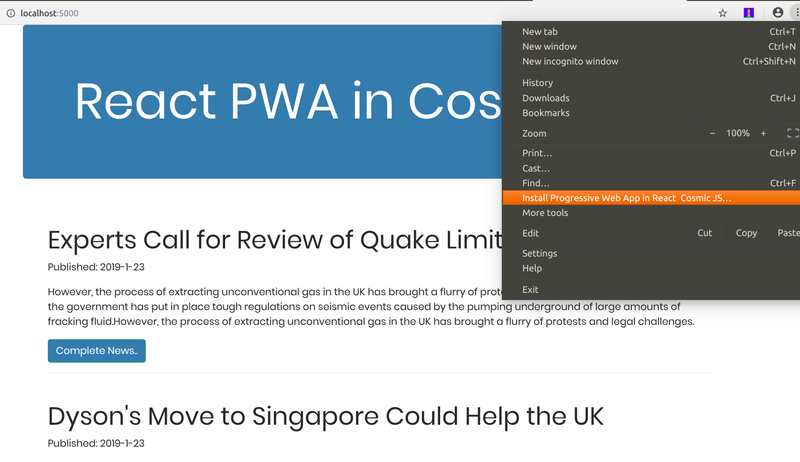 Here we have created the platform to implement our PWA, so let's move to the next one. In our bucket, there is an object-type "Admin". Create an object with title admin, and metafields email & password. You can give the values of email and passwords according to you. Here we gave email: admin@abc.com and password: admin. Later you can use them for admin login in our demo. On this page we are simply logging the admin in. We have statically created the email and password in the object-type "admin" and with those credentials we are logging him in. Here we imported the authentication service and in the onSubmit() function we are calling the login() function which is declared in the authentication service. In componentDidMount() we simply applied navigation when admin already logged in. In this component we simply displayed the three links: Home, Add News and Logout. From here admin can navigate to main page, of can add a news or can logged himself out. This is the news.js and it is fetching as well as displaying the news on the home page of our app. We are explaining the working of getNews() method. If your device is online, then it is fetching data from backend and displaying on the template and also saving it on browser for offline use too. If the device is offline, then it will get the saved data from browser memory and will show to the user. 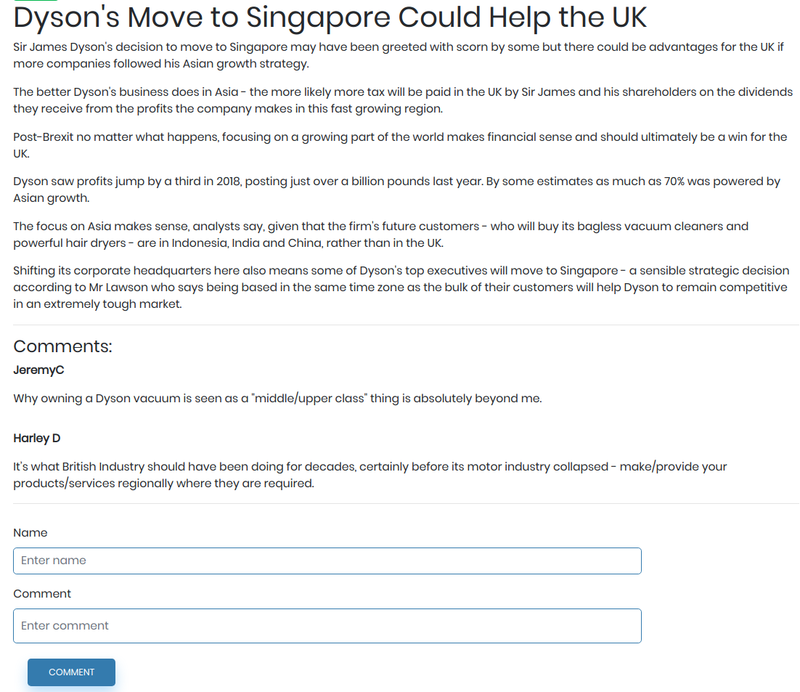 It is displaying the single news as well as there is an option of comment also. Comments related to the post are displayed here and you can add comments also. singleNews() method is fetching the news at one time and we applied a filter to get the selected news. allComments() function is getting all comments and filtering the comments related to this single post only. Authentication Service: This is only for logging the admin in. There is one method defined which is searching the email and password supplied the the login page and returns the result to calling method. submitComment(): This method submits the comment in the object type "comment"
We managed data on Cosmic JS properly, for this we created some object-types to understand the nature of each datum. Here is three object types : admin, news and comment. Admin stores the information of admin, and news stores the news published by admin. Comment object-type is storing the comments published by readers of our news app. What Have We Built Till Now? I want to make clear that our app is an ordinary app until now (in development mode); it doesn't have any PWA features, so let's start making it progressive in nature. When we created this app, it already created a file serviceWorker.js in the src folder, which handles the progressive nature of the app. At the time of online use, it automatically stores the static data of the app and reflects when the app is offline. Our app is partial-progressive in nature now. It is storing data while offline but it can't be installed on the device yet. We'll make that happen in the next step. Here we added path of two icons, one for desktop and the other for mobile. Their size should be exactly the same and these two icons should be present in the public folder. Start_url is showing the path of build. This is the main basic coding of manifest and now our app is pure progressive in nature. In ths above screenshot you can clearly check that Chrome browser is giving the option to install this React app on your system. 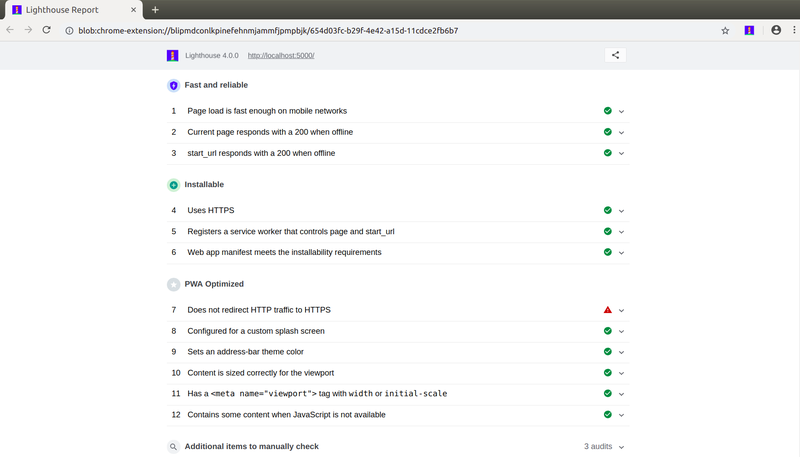 In report each milestone achieved by our app except 7th, which is an https related and will be fixed as we deployed it to our Cosmic JS server which supports HTTPs. Finally you made all necessary changes and it is now ready to deploy. 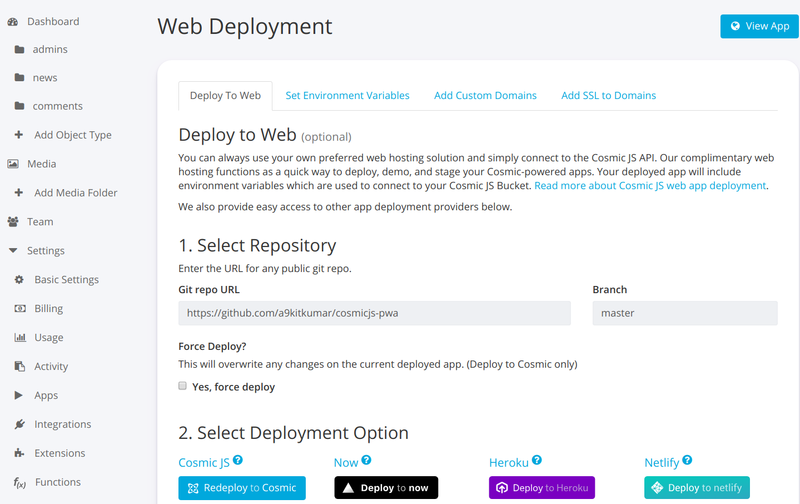 Now go to: bucket>setting>deployment and click button deploy to Cosmic. After successful deployment you will receive an email and click on "view app" button to view the app. It is clear that with the help of Cosmic JS we can create powerful apps and can deploy on their server without any server setting or configuration. 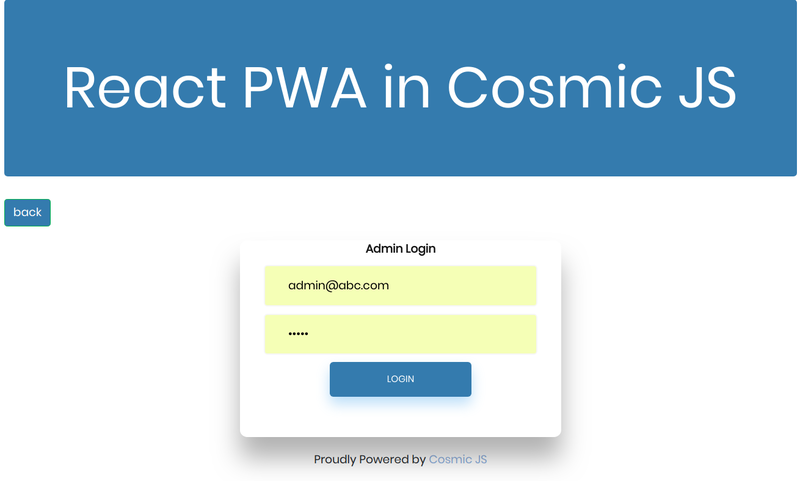 Here we created and deployed our React.js progressive application on Cosmic server easily without any difficulty. You don't need to install any extra software to deploy over here. For any query or comment related to building apps in Cosmic JS, reach out to us on Twitter and join the conversation on Slack. Cosmic JS makes it easy to manage content for your Vue.js applications. In this blog we'll quickstart a Vue.js RPG Adventure Game using the Cosmic CLI. Our game, "Enter The Cosmos", is a turn-based, RPG style game built using Vue.js, Node.js and Cosmic JS. Thanks to all who attended our first webinar / AMA last week. There was some great engagement and questions that helped steer the screen-share webinar for users in the Cosmic Community as well as first-time visitors to the system. If you missed it, check out the video and attend our next one. This is a quick example to show some of the powerful things you can do with the Cosmic JS NPM Module. This script will, add a Bucket to your Cosmic JS account, add an Object Type (Pages) and add a few Pages. In this video tutorial, I show you how to use the Cosmic CLI to install and deploy a Cosmic JS GraphQL-powered App in 5 minutes. An application for book lovers to view a list of their favorite books. When teams are planning content campaigns, they can't be expected to deploy content real-time. Scheduled Posts makes a content editor's life a lot easier.